Please help with this SG copy. Discussion in 'SG Copies' started by tom jones, Apr 18, 2018. Hello, I got this on a trade. It has been repainted, all electronics replaced. The pickups seem to be original. vintage pickups with mental shielding. What makes you so sure it's a copy? Looks like a Special with a refinish. I don't know I just assumed it was, there is no serial number on the headstock. Your assumption that it's a copy is correct. 1. Neck and headstock configuration incorrect. 2. Control cavity shape incorrect. 3. 12th fret dots spaced too close together. 4. Batwing not under the bridge. 5. TRC too far from the nut. 6. Batwing junction at 22nd fret incorrect. 7. Upper frets and body junction incorrect. 8. Controls and output jack location incorrect. I don’t approve of the logo being on that headstock as it is a misrepresentation. The combination of bound neck with dots and crown inlay is not a legit configuration on an SG. 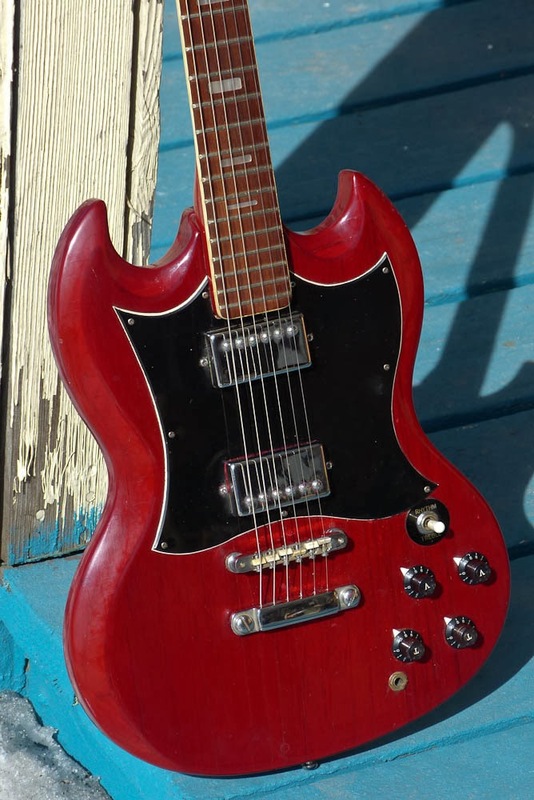 Bound necks with dots are a feature of 1960’s SG Specials and modern SG Classics. Those models never had crown inlay on the headstock. Modern SG Specials have unbound necks with either dots or 1970’s small blocks. The crown inlay on this copy is placed at same location as a 61 RI yet it does not have the wider headstock of a 61 RI. Well, the neck is set in deep like a bolt-on and the bridge is sitting right on the body because there's no neck angle, so whatever it is, it was originally a bolt-on that got set in at some point. My best guess is that it was originally an Epiphone G-310. I saw the exact same similarities with the G-310. I'm curious about the headstock. I'm assuming a gibson veneer was applied during the repaint, and it was a crappy job if this is a newer guitar. And what's up with those W.German tuners? Assuming it was originally a bolt on, it's also interesting that the neck pocket holes were filled then a proper strap button was placed but later moved to the horn. Here's a really dumb question, how bad is it to glue on a bolt on neck? Any way it could be a japanese copy from the 70s? The tailpiece says "Gotoh Japan". If done right, perfectly fine. But they didn't shim the neck, so it was pretty lazy or just amateur. The tuners are Schallers, they're a German company. I think the older ones said W. Germany. Headstock was probably reshaped. At first I thought it might be an old Matsumoku. The neck certainly isn't, but the body could possibly be. But never go by a tailpiece, especially on such a mutt as this. They're as easily replaced as strings (actually, easier). OK thanks, I will prob just keep it as knock around guitar. Plays good and sounds good. the deep set neck ? This is a weird one for sure! Replacement brass nuts can be purchased from StewMac. I didn't think there was enough truss rod on an import to do that. I misunderstood your post and thought you were interested in where to source the brass hex nut for the truss rod. I've had to replace one in the past after it got rounded over trying to extract it after it had embedded itself into the wood. PermissionToLand and JazzyJeff like this. Yeah, I have never seen an import with the brass nut style truss rod. The very first item I noticed right away was the crown inlay does not belong there. 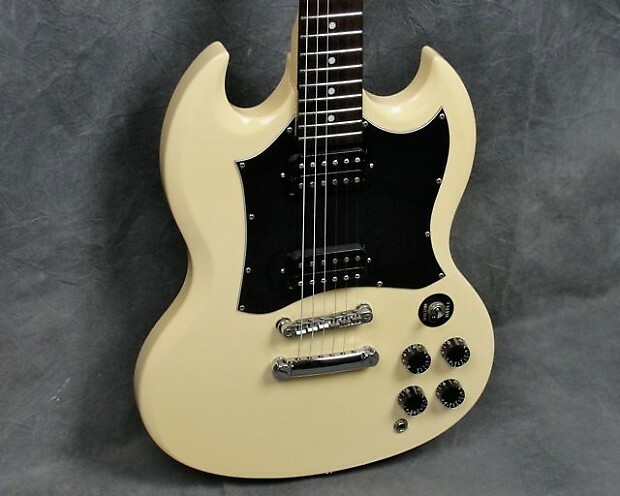 I have never seen an SG Special with a bound neck, dots and crown inlay. The second item is the 12th fret dots are spaced too far away from the edge of the board on the copy. 1960's SG Specials have bound necks with the 12th fret dots close to the edge of the board. SG Classics have bound necks and modern SG Specials have unbound necks. The 12th fret dots on both of those models are pushed slightly away from the edge of the board. On the copy, the 12th fret dots are pushed even further away from the edge of the board. I have never seen an SG Special from any era with 12th fret dot spacing like the one on the copy.